The iron skeleton of West Pier, Brighton designed by Eugenius Birch. 1863-66. This was Grade I listed in 1869, when it was the only pier in England to be given such a listing. Damaged by sea, storm (1987) and arson (2003), it had been derelict since the mid-1970s, and only this much of the metal skeleton survived when the photograph above was taken in 2006. 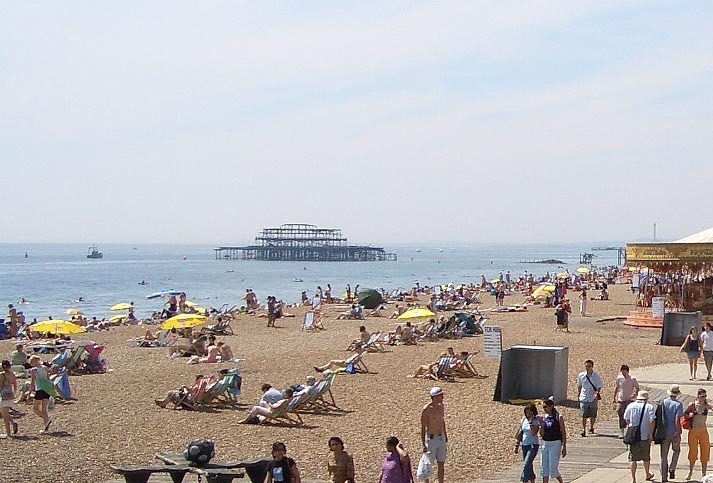 The Brighton Argus of 24 June 2006 reported that engineers were then being called in to remove most of the "iconic structure." English Heritage had hoped to recover and preserve the pier's theatre and entrance, but it was too late for that by then. A late-ninteenth-century photograph (c.1890-1900) from the Detroit Publishing Company, 1905. Source: Library of Congress LC-DIG-ppmsc-08044. Note the bathing machines near shoreline. Originally the West Pier had an open deck with only six small ornamental houses of oriental design, two toll houses and glass screens at the pier head to protect visitors from the wind and sun. In 1875 a central bandstand was added. In the 1880's weather screens the full length of the pier, steamer landing stages and a large pier head pavilion were constructed. This was all in place by the time the late-nineteenth-century photograph was taken. 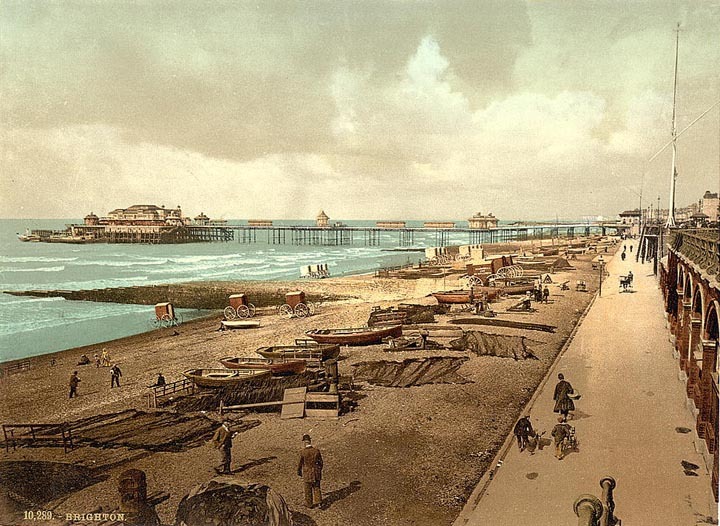 The pier was of special importance because, according to Paul Dobraszczyk, it was "influential in popularising an ornamental approach to ironwork in the superstructure of piers" (143) — and, no doubt, on seaside promenades in general. Dobraszczyk also suggests that the scrolling and twining of the more decorative ironwork, like the fanciful pier structures themselves, may be attributed to the proximity of Brighton Pavilion with its oriental design — in which case the Pavilion would have had far-reaching effects not only on the still surviving Brighton Palace Pier at the other end of the promenade, but on sea-fronts all over the country. "End of West Pier in Sight." The Argus (online archives). 24 June 2006. Web. 26 April 2018. "History of the West Pier." West Pier Trust. Web. 26 April 2018.